We can create your very own wine cellar/room using a mix of different wine racking methods. Wine cellars and rooms for private homes and commercial properties such as restaurants and bars. We can provide and install (if required) wine racking for all sized rooms and areas throughout the UK. 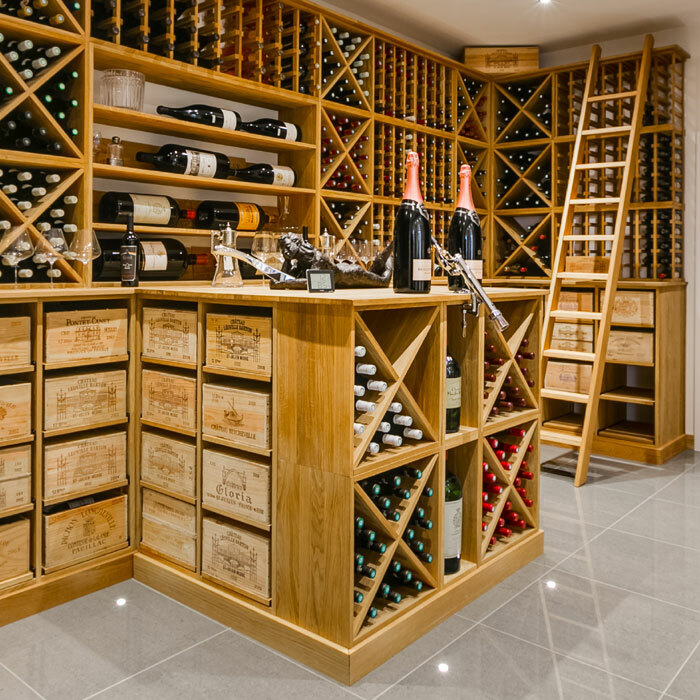 If you have a large area or room which you’d like to convert for wine storage, whether it’s a designated room or area for your wine collection, get in contact with Wineware today and we’ll be happy to help! 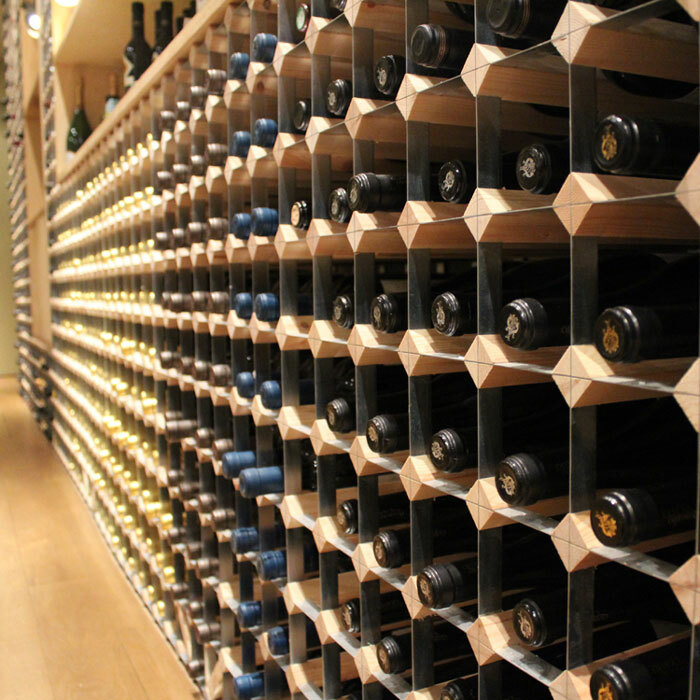 We’re able to design, create, supply and install your dream wine cellar in your own home or restaurant. We’re proud to say that with over 12 years’ worth of experience and what seems like an endless amount of fantastic projects, we’d more than capable to provide you with the wine cellar of your dreams. Looking to store your own wine in your home, restaurant or bar? Our handy wine storage guides can help! Traditional wine racking is by far the most popular style of racking, you’re able to store the most amounts of bottle this way in the natural pine and galvanised steel racks. Available in different depths and an array of stains, these racks are made to measure to your individual requirements. No project is too big and no project is too small, we’ll create and supply any shaped room or area! Our hand-crafted bespoke hardwood racking is available in either pine or oak, the only difference between the two is the material it's made of, with Pine being more cost effective than Oak. This style of racking is made to order and can be tailored to fit your own individual requirements and available space. We’re able to create a mixture of the standard individual bottle storage units, cellar cubes and case racks, creating the perfect cellar to house your valued wine collection in. If you’re storing traditional Bordeaux style cases, keeping them in pristine condition, off the floor and safely stored is essential. This is especially true if you’re a wine collector and wish to one day sell the cases you own; case prices can decrease in value if the wooden case isn’t in top quality. We’re able to provide different height shelved case racks which have pull out draws on runners, allowing easy and affective access. Wineware’s wine storage cellar cubes (also referred to as Wine Bins) can hold up to 24 bottles at any one time. This type of wine storage is popular when storing the same bottle(s), with 4 individual compartments to each cube, you’ll find it quick and easy to access the bottle you want. Available in different depths and a selection of stains, our wine cellar cubes can be designed to fit into your requirements if the measurements don’t quite match up. We’re able to create the perfect wine cellar to match your own individual requirements, if you have specific requirements or you’re not too sure what you’d like or prefer, our helpful team at Wineware can assist you in creating your dream wine storage. View some of our Custom Wine Rooms and Cellar Projects. How to get my own Wine Cellar? If you're interested in installing your very own wine storage system for your home or bar, get in contact with Wineware today and we can discuss all of the possibilities you require. Whether it's just a small space for a handful of bottles or an entire room, we'll be happy to help and offer some advice. 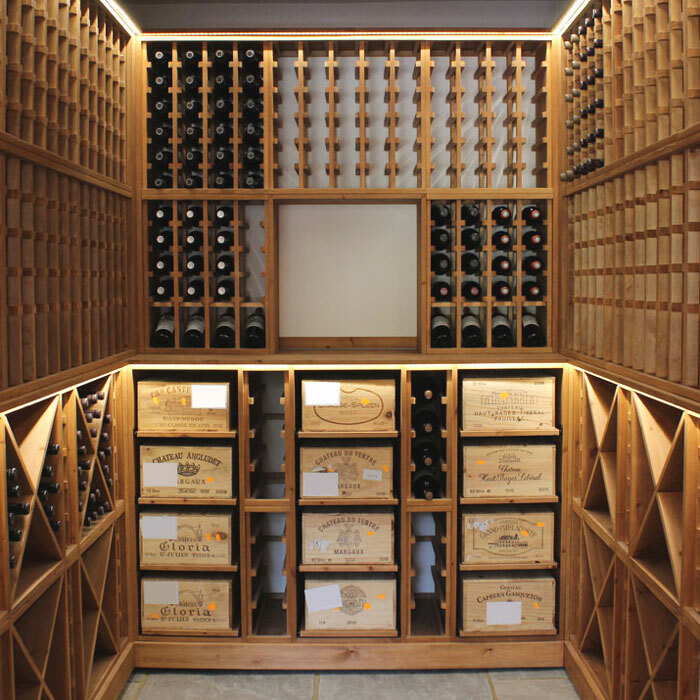 Want to know what some of our customers have said about their own bespoke wine cellar projects? See our Custom Wine Cellar Testimonials for some helpful insight! We're able to produce computer generated drawings of the potential wine rack design we can install in your home or commercial property. Once we have some information about your requirements (type of racking and measurements), we can provide you with a FREE quote and 3D design!